Dice tomatoes and place in a strainer over a bowl, or on a bed of paper towels in a baking sheet. Generously salt the tomatoes to draw the water out. Cover and allow to sit for 30 minutes to an hour, pressing down on tomatoes from time to time to help release liquid. Slice and toast bread for 8-10 minutes in a 325 degree oven. 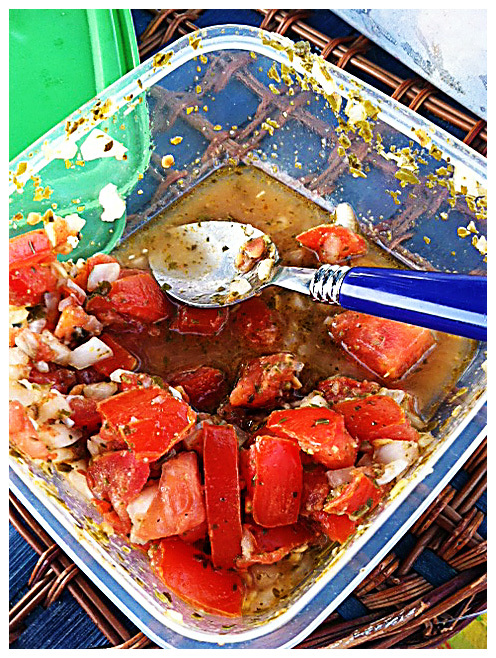 Mix drained tomatoes, diced onion, pesto sauce and 1 tablespoon olive oil in a bowl. Add more olive oil one tablespoon at a time as needed to create your preferred consistency. You kind of have to eyeball it, as the amount of liquid needed will vary depending on how much liquid you were able to extract from the tomatoes. I usually find that 1-2 tablespoons is plenty. Salt and pepper to taste. Set tomato mixture aside for the flavors to marry. Brush the tops of your bread slices with a light coating of olive oil (this seals the bread so it can’t absorb too many juices from the topping and get soggy. VERY important if you prepare this for a cocktail party and the little toasty things sit around for a little bit). Arrange your toasts on a plate, top with tomato mixture, lightly drizzle with balsamic vinegar, ensuring that each pile of tomatoes gets a nice hit of acid. If you don’t have balsamic vinegar, a spritz of fresh lemon juice is nice substitute. Next > Restaurant 101: The Kitchen opens @ 5….